Want to Volunteer with Animals? Learn how to work with mini horses and a donkey at the Hearts & Hooves Ranch. On-site volunteer (at the ranch) will help, clean stalls, water buckets,groom, events on site, assist with training for visits and other physical tasks. 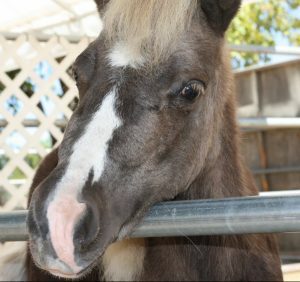 Off-site volunteer (at hospital and other health facilities) will help prepare horses for animal assisted therapy sessions/visit (grooming, hoof care, etc.) then assist during the hospital/facility visit with crowd control, safety and finally help clean up after visit. All off-site volunteers MUST use their own vehicle. Requirements: Must love horses (especially mini horses) and other farm animals. Be able to lift 3o lbs and enjoys working outside. Skills & Experience - please check all that apply. A volunteer will email you to set-up a convenient day and time for an online orientation and identify the right job for you. To speed-up this process, please let us know your availability for a 30min Skype or telephone call and the best number to reach you. Please let us know what made you choose us! If you are seeking service hours to fulfill another organizations requirement (school, church, etc.) indicate that here. Please note that 1 FUR 1 does not accept volunteers looking to fulfill court-ordered community service hours.